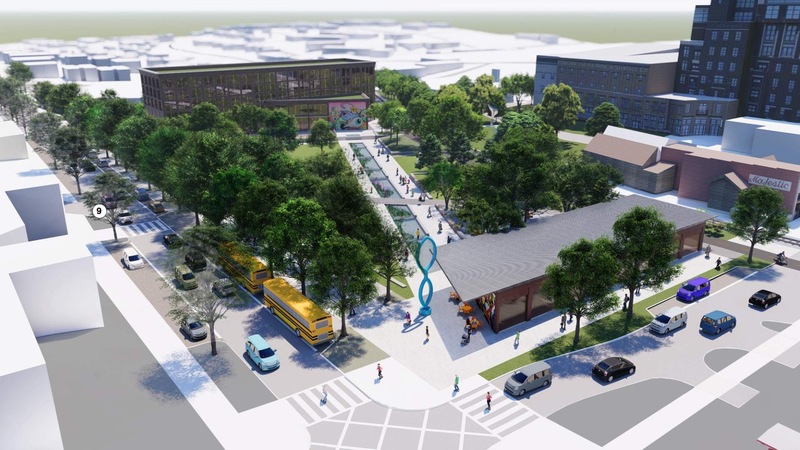 A rendering shows what a redeveloped West Avenue parking lot could look like at the corner of Dickson Street and West Avenue across from the Walton Arts Center. A two-hour discussion on Tuesday about the city’s upcoming bond referendum was dominated by concerns over parking in Fayetteville’s entertainment district. City Council members heard the first reading of a proposal that would call a special election in April to renew the city’s 1-cent sales tax that voters approved in 2006. Just like 12 years ago, if approved, the money would be used to pay for a list of proposed capital projects. The bond issues would generate about $226 million that would be used for road, drainage, trail and park improvements; economic development; construction of a cultural arts corridor with potential new parking facilities; a new police headquarters; a new fire station; various city facilities improvements; and refinancing outstanding sales tax bonds. The proposed language calls for 10 separate ballot measures for each area of funding. The special election will likely take place on Tuesday, April 9. Chief Financial Officer Paul Becker said Tuesday the bonds could be paid off in 10-12 years. The discussion on Tuesday centered around construction of a cultural arts corridor, which would include redevelopment of the West Avenue parking lot at the corner of Dickson Street and West Avenue across from the Walton Arts Center. The latest concepts for the project show a landscaped lawn area with flexible event space, a promenade, interactive water features, pathways, a stage, a pavilion, and buildings for cafes, galleries or offices. Mayor Lioneld Jordan has promised that he would find a way to replace the 298 parking spaces that would be lost during redevelopment of the lot, however the language in the proposed bond issue isn’t as specific as some downtown business owners would like. Council member Justin Tennant said he thinks it would be better to include language in the proposal that guarantees replacement of parking instead of just suggesting that it will be replaced. He said he trusts the mayor, but said residents might feel more comfortable voting for the arts corridor if a promise was included to replace parking. City Attorney Kit Williams said it could be tricky to draft language guaranteeing replacement parking while also leaving the city enough flexibility to amend its plans in the future if necessary. He said if the language guarantees a new parking facility, then it must be built regardless of whether some other opportunity arises that could address parking or if replacement parking somehow becomes unnecessary. He said the language was carefully crafted to give the city some room to work based on the mayor’s promise, but so as not to bind the city into building a parking deck no matter what. Council member Kyle Smith said while he does think that losing the West Avenue lot would be a “disaster,” he wants to make sure there’s enough flexibility in any added parking-related language that allows the city to build what it needs. Council member Matthew Petty said the city should be cautious when making a commitment to replace or add parking without specific data that proves it’s needed. He said a recent parking study found there are thousands of parking spaces in or near the entertainment district that are either underutilized or could be accessed for public use. That study, he said, suggested the city address those spaces before building a new parking deck. He said he would support the idea of building a deck if it’s found to be necessary at some point, but said it would be a mistake to bind a future council’s hands without knowing what the future will actually bring. Chief of Staff Don Marr said while there is data that suggests underutilization of some parking spaces, there’s also data from citizen surveys that suggests a majority of drivers value proximity when considering parking. Some of the spaces that were deemed to be underutilized include the Washington County Courthouse parking lot, which is east of College Avenue and several blocks away from the West Avenue lot. On that same note, Marr said if the language is to be tightened when referring to replacement parking, then proximity should be considered. Williams said his office would begin work on possible new language that could be formally revisited at the next council meeting on Dec. 18. Petty suggested the council in the meantime hold a work session to go over each project in the proposal for possible changes. Five people who spoke Tuesday advocated for construction of an indoor aquatics center, which isn’t on the list of proposed projects. Petty said there could be other projects the council might want to discuss before approving the special election. The council agreed to discuss the proposal at the agenda-setting session on Tuesday, Dec. 11.